Local shares bounced back yesterday after a dip on Thursday, due to Wall Street's solid overnight showing and encouraging domestic growth data. 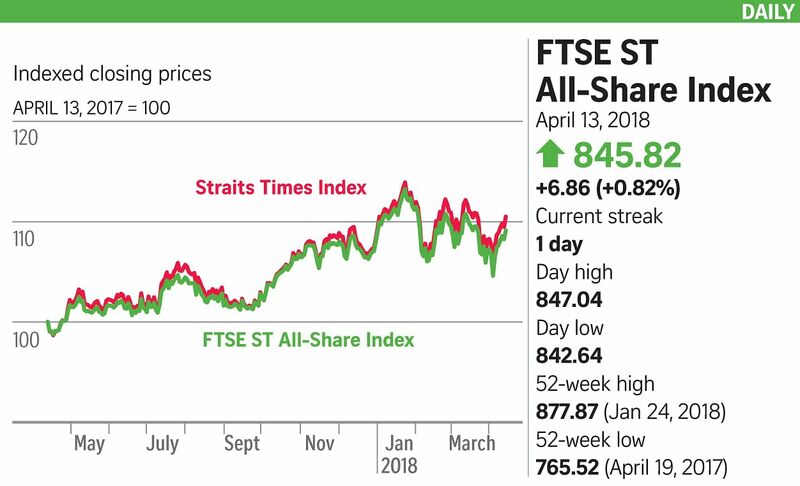 The key Straits Times Index (STI) advanced 32.69 points, or 0.94 per cent, to finish at 3,501.30, and up 59 points, or 1.7 per cent, for the week. Other major Asian bourses closed mixed following the sharp rise on Wall Street amid easing United States-China trade tensions and geopolitical concerns. News that US President Donald Trump may consider rejoining the Trans-Pacific Partnership trade pact gave sentiment a further lift. Key indices in Japan, South Korea, Australia and Taiwan finished higher, while China, Hong Kong and Malaysia ended the week on a lower note. Advance estimates for the first quarter showed the Singapore economy grew 4.3 per cent year-on-year, which was in line with forecasts. The Monetary Authority of Singapore said it will allow a "modest and gradual" appreciation for the Singdollar, moving away from the neutral stance it has held since April 2016. DBS senior economist Irvin Seah said: "This is consistent with our view that while economic conditions have normalised... a slightly slower pace of appreciation will enable the economy to cope with the overhanging uncertainties in the global environment." Nevertheless, volatility is expected to persist in the markets, with StashAway chief investment officer Freddy Lim pointing out that "we are still in the midst of a correction". The STI has continued to be one of the most resilient benchmarks of the region this year. It has racked up 2.3 per cent total returns, compared with the benchmarks of Japan, Hong Kong and Australia, which are averaging a 1.7 per cent decline, while the Dow Jones Industrial Average has fallen 2.2 per cent, according to Singapore Exchange data. Turnover here yesterday came in at 1.4 billion shares worth $1.3 billion, with gainers beating losers 273 to 151. Banks led the gains: DBS Group Holdings rose 1.2 per cent, United Overseas Bank added 1.1 per cent, and OCBC Bank advanced 1.9 per cent. Lippo Malls Indonesia Retail Trust slipped three cents, or 8.2 per cent, to 33.5 cents and was the day's fourth-most active with 46 million shares worth $16 million done. The movement came after a couple of research houses downgraded their call on the stock, citing Indonesia's new tax regulations that could hit the trust's distribution per unit.